Last March, while travelling to Melbourne from Warracknabeal, I came to Bung Bong. This area, which sounds like it was named after some defective piece of drug apparatus, is on the Pyrenees Highway. I stopped where the highway crosses the Bet Bet Creek. Next to the crossing are the ruins of the old Bung Bong road bridge, also known as the Glenmona Bridge. Built in 1871, this bridge replaced its wooden predecessor which was washed away by extreme flood waters the previous year. The three span bridge is made of bluestone piers and abutments which support three, wrought iron, lattice trusses. 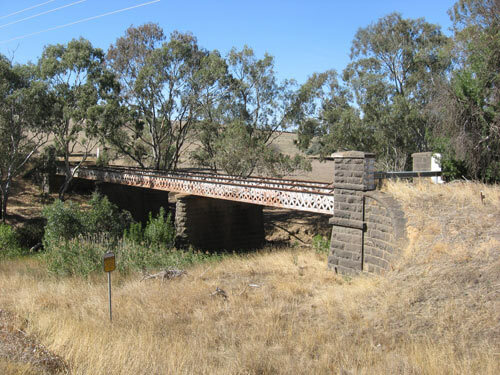 Rather than importing them from England, these forty six and a half metre long trusses were the first of a series to be used for main road bridges in rural Victoria. They were manufactured in Ballarat and are considered to be”significant artefacts in the history of manufacturing in Victoria”. When finally at the bridge, I saw that the main deck that would have rested on the bridge’s trusses was gone. I later read that this deck, made of wooden planking, was destroyed long ago by fire. The three trusses however were still clearly visible. Unfortunately this also meant that they were now at the mercy of the weather. Looking after such significant sites appears no longer to be of a high priority. 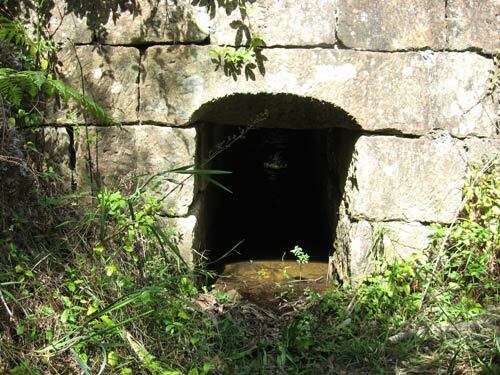 I was reminded of the sandstone block culverts that run under the historic Mitchell’s Pass on the lower Blue Mountains in New South Wales, very close to where I live. Constructed by convicts nearly one hundred and eighty years ago, a descent through overgrown weeds and shrubs is now the only way you can find and appreciate them. These thoughts from the Victorian countryside returned to me last week when walking above a very deep, sandstone cutting which leds to the eastern portal of the now disused Lapstone Tunnel. Use of the tunnel began at the end of 1892. 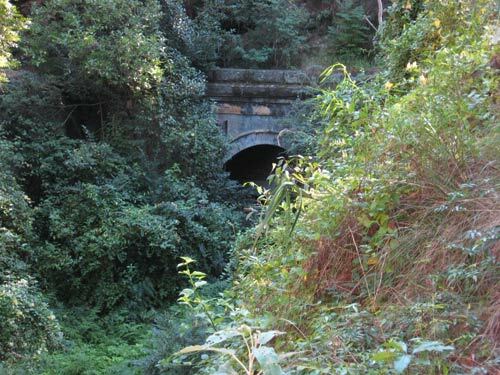 This single rail tunnel was part of the first attempt to deviate from the Lapstone Zigzag Railway. The zigzag had been built in the 1860s by John Whitton and opened in 1867. Whitton’s limited budget did not allow for the construction of a tunnel. 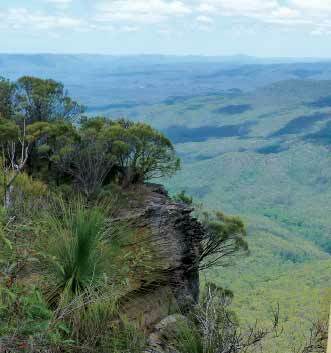 The zigzag was therefore his solution to the dilemma of getting a railway line successfully onto the Blue Mountains, west of Sydney, New South Wales. The zigzag railway was used for twenty five years. The ridge line opposite to where I walked was the vantage point from which the well-known Australian artist Arthur Streeton captured the tunnel’s construction. From sketches and water colourings he made at this site in 1891 while residing at Glenbrook, Streeton created his famous oil painting Fire’s On. It now hangs in the Art Gallery of Sydney. He likened the eastern portal to “a great dragon’s mouth”. He was fascinated by the depth of the sandstone cutting which leads to the tunnel and the way not only the workers at the base of the cutting but also the gum trees along the tops were so diminished in size. These days the cutting’s depth, while apparent, is mostly hidden by trees and undergrowth. I know it all comes down to money and many of our places of historical significance do not generate the dollar. This possibly explains why many tourist information centres do not consider the provision of information about these historic sites a high priority, unless of course they can in some way provide a financial return. The upkeep of such sites through their conservation, restoration and maintenance puts considerable demands on the public purse strings. This does not take into account the other problems relating to public safety and liability when visiting such sites. It is a real problem because as Australians we should be aware of our country’s rich history. What better way to achieve this than to visit the areas of significance and hopefully appreciate that history more readily.